Today's post is dedicated to our former web developer Krystine, who helped us launch a number of our custom wallpaper and event decor sites. In addition to being a genetically predispositioned master web programmer and coder, she is also a burgeoning performer. Specifically, she is a member of the new generation of sideshow performers. Krystine specializes in fire breathing, walking on glass, and pounding nails up her nose (aka the human blockhead). This unprecedented combination of personality traits and skills made her a valued member of our team, but alas, she has moved on and is currently performing in a sideshow act on Coney Island. 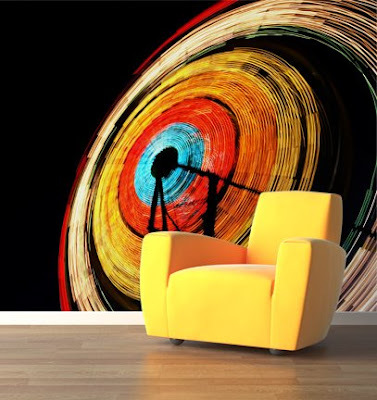 The custom wall mural we're featuring in the inspiration room may not be as dark as one Krystine might commission, but it has the carnival/circus vibe that we're going for. The spinning ferris wheel was photographed with a longer exposure time, giving the lights a motion blur. The swirling lights in the wall mural are set off nicely by the black background, creating the perfect carnival custom wallpaper installation. There's plenty of other ways you could proceed with a carnival themed custom wallpaper. Consider using shots of a carousel, or old sideshow photographs for a more vintage feel. Carnival posters would also be a great reference for a sideshow themed wall mural. Check out Krystine's website to explore more about her and her act. And if you make it to the sideshow act on Coney Island (avoid the rat show nearby!) say hello to Krystine for us.